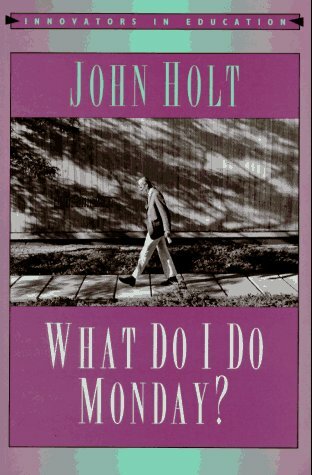 John Holt GWS - What Do I Do Monday? "How do we make available to children the experience of writing, putting down on paper some of the real thoughts and feelings they have inside? One thing we must not do. We must not treat writing as a "skill," something that can be exercised all by itself. As Wendell Johnson put it, 'You can't write writing." We cannot teach children "the skill of writing" in a vacuum of ideas and feelings, by having them write exercises or essays that we think are good for them, and then expect them to take the "skill" and being to use it to write something important. They can only learn to write well by trying to write, for themselves, or other people the want to reach, what they feel is important. It is not much help to say, "Write about anything you want." This freedom of choice is essential for children, but it may not help them much if they have no idea what the possible choices are. And it won't help at all if the writing they have already done in school has made them feel that all writing is painful and dull or that they can't do it."